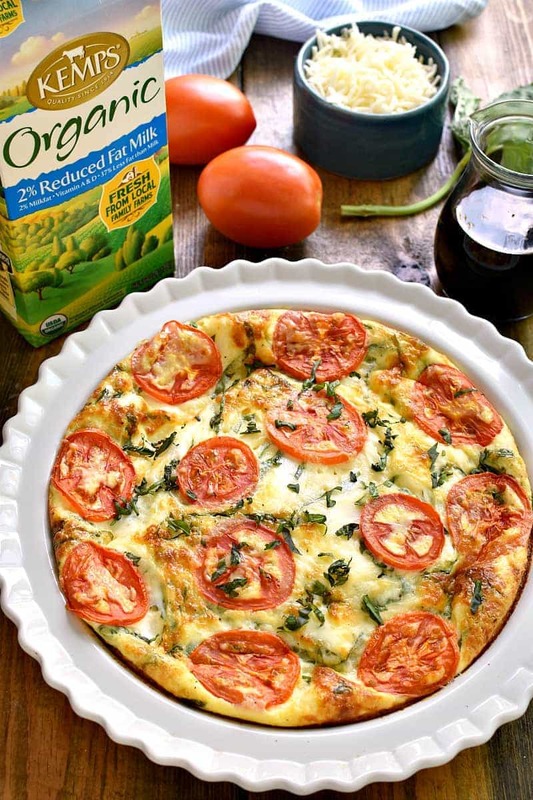 This Caprese Quiche is the ultimate summer breakfast! Loaded with fresh tomatoes, basil, and mozzarella cheese, it comes together quickly and has all the best flavors of summer! And…it’s not just for breakfast. 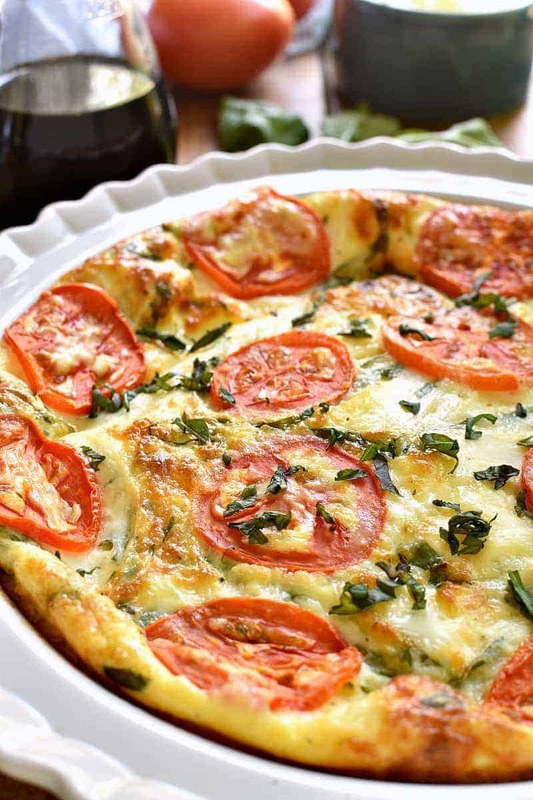 This Caprese Quiche makes a great lunch or dinner, too! So. We’re one week into summer break. And to be honest, I’m not entirely sure it feels like summer yet. Not because of the weather (it’s been hotter than hot) but because for the first time ever, I signed all three older girls up for Girl Scout Camp. So they are gone daily….from 7:45 – 5:45….which is actually longer than a school day. Meaning that whole summer thing? It hasn’t quite kicked in yet. No, we’re actually up earlier than ever, and the girls are out the door a half hour before the bus would ever get here. And they’re outside all day long, doing ALL the fun things, and by the time they come home they are EXHAUSTED. And hungry. So suddenly…both breakfast and dinner are of the utmost importance! 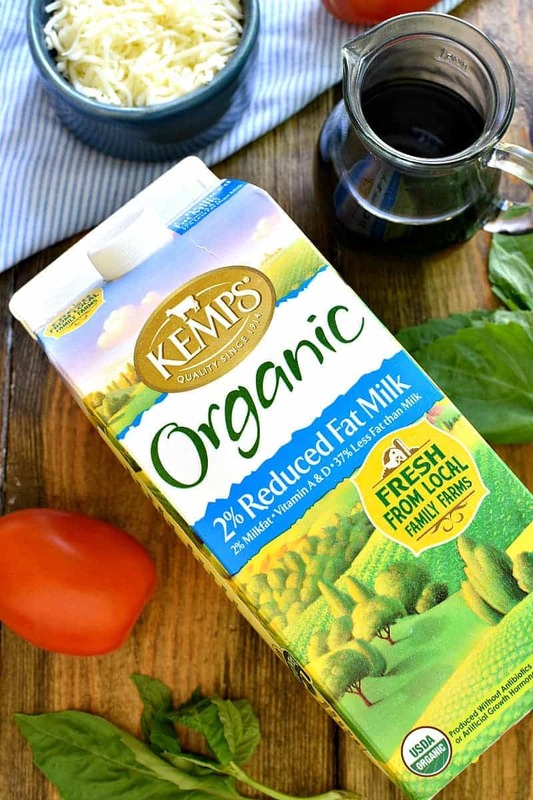 Have you seen the new Kemps Organic in stores yet? It’s now available in a half gallon size at Pick ‘n Save, and has quickly become my new favorite. I love that it’s locally sourced from family owned farms and delivered fresh to the store. And it tastes great, so my kids love it, too! And when it comes to this Caprese Quiche, well….we’re ALL loving it. It’s light and fresh and SO perfect for summer. 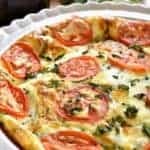 I love caprese flavors any way I can get them, and this Caprese Quiche is no exception. And you know what? I have the feeling we’re going to be eating it ALL SUMMER LONG. 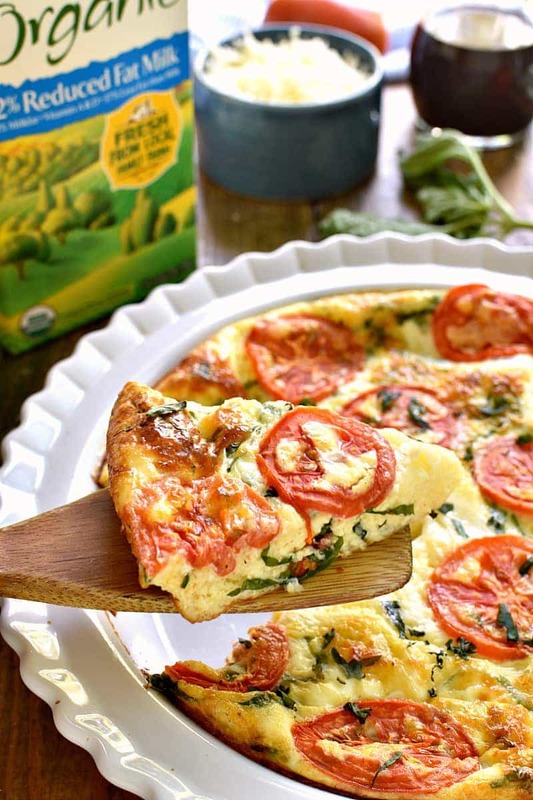 Looking for more great recipes using Kemps Organic Milk? Try my Strawberry Shortcake Milkshake and my Buttermilk Ranch Dressing! 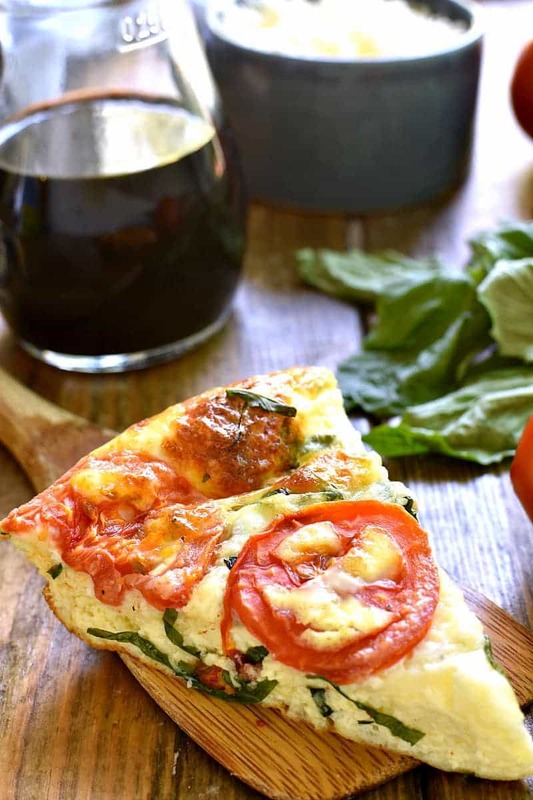 This Caprese Quiche is the ultimate summer breakfast! Loaded with fresh tomatoes, basil, and mozzarella cheese, it comes together quickly and has all the best flavors of summer! And...it's not just for breakfast. 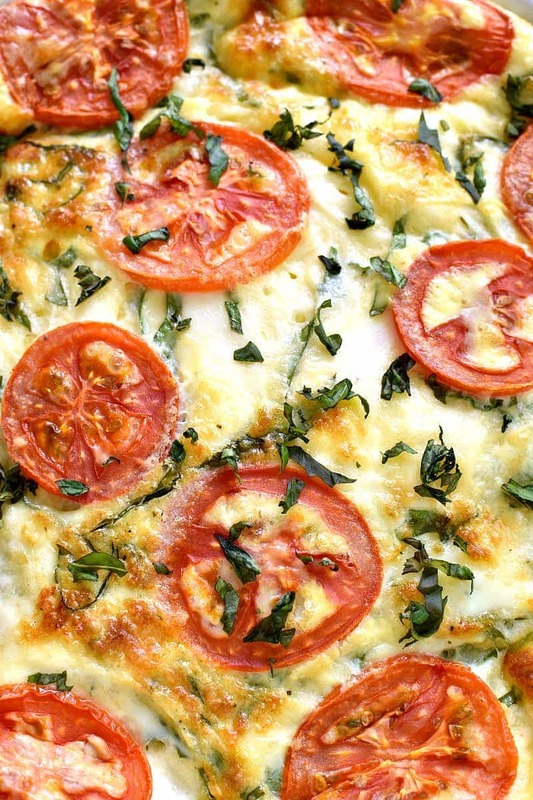 This Caprese Quiche makes a great lunch or dinner, too! Combine all ingredients except tomatoes in a large mixing bowl. Pour into greased 9 inch pie plate or 8 inch square baking pan. Top with thinly slice tomatoes and extra basil as desired. Bake at 350 degrees 45 minutes. This is gorgeous and my perfect quiche! Caprese anything is my jam! Things never seem to slow down right? Especially during summer it seems. So glad to have delicious food like this Caprese Quiche that I can enjoy any time of the day regardless of busy schedules! Perfect for meal prep! Just when I thought quiche couldn’t get any better! This is amazing! This looks amazing! I am now counting down the days until my garden tomatoes are ripe. The second they are I am making this beauty! This quiche is so perfect for a busy summetime meal! And it sounds like a wonderful start to the summer, though your girls haven’t been around during the day yet! Thank you for simple recipes. I cook for two and being a senior, I don’t keep a lot of cooking products on hand because they get old and have to be thrown out. I will try this as I have a wonderful herb garden with plenty of fresh basil. It is hotter than hot here too! I’m loving this as a light dinner option. Perfect! You had me at caprese! I love this for a brunch option! I love this for our weekend brunch! It sounds so good! I’m usually not a big fan of quiche, but I this twist looks and sounds really good! Pinned! Do you have the nutritional info for this recipe? Looks great! Mmm definitely going to try this! What are you favorite things to pair with it? id love that too for weight watchers! Made this quiche and it was a HUGE success!!! Seriously so delicious!! A few things I changed: I put a crust under my quiche because YUM. Also I added one egg (just because I had one left in my carton) but due to the added crust and added egg I had to put a cookie sheet under mine while cooking so it didn’t get everywhere. One other thing, mine took about 20 minutes longer to cook than said in the directions. But like I said, I took this to a baby shower brunch and it was a huge hit! Everyone was asking for the recipe. I’ll definitely be forwarding this page on to my friends. Made this and another quiche for out of town company. Everyone loved it. Found that I needed to bake it for a full hour. Does this really take 5 eggs, PLUS 5 egg whites? I just want to be sure!